“Myth of Modernity” focuses on Thai Buddhism, specifically the simplification over time of ornate architectural structures of worship. These structures that pervade Buddhist culture, such as pagodas, palaces and spirit houses, were symbolically built to represent the ‘three worlds’ of Buddhist cosmology. The influence of modern architecture and the West have resulted in the popular reduction of these forms into the geometric pyramid. 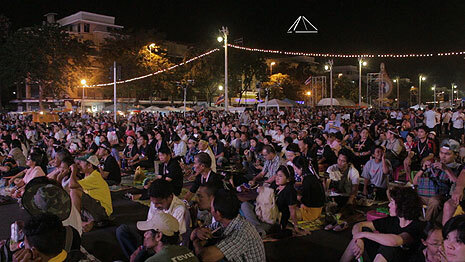 Drawn-out political conflicts beginning in 2005 led to anti-government protests that gripped Thailand from late 2013 to early 2014. 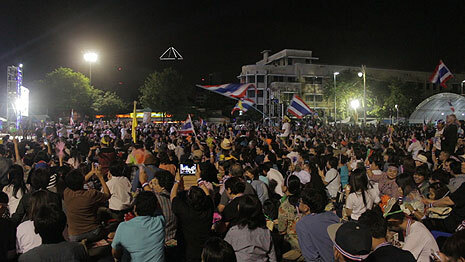 Entrenched corruption and cronyism by the government were cited as the reasons motivating over one million people to take to the street, lay siege to government buildings, close off several of Bangkok’s main roads and demand that national reforms take place before any election is held. These political demonstrations arose out of a sense of patriotism and morality as well as a desire to maintain the essence of Thainess and make a stand against corruption by politicians, with protesters’ goal being to restore the peace and happiness of the past. The demonstrations also served to reflect political ideals influenced by the Buddhist concept of cosmology known as the “Tribhumi,” which holds that the universe consists of three worlds, Kama, Rupa and Arupa, with Mount Meru standing in its center. The Tribhumi concept is intertwined with beliefs in the Law of Karma, which exhorts members of society to do good, feel shame over moral transgressions and fear their results. 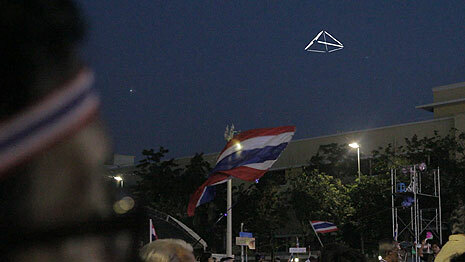 Over time, these beliefs came to shape the moral standards and government structure of Thailand. These same beliefs influenced the design of traditional architecture as well. Earthly replicas of the heavenly Mount Meru, stupas, palaces and spirit houses all followed the same shape, rising from a wide base and tapering to an apex. In modern times, however, architectural design has been shaped more by Western influences, leading to the practice of paring down details of traditional structures in order to harmonize them with surrounding modern architecture. The most obvious examples of this can be found in spirit house design. Once sporting intricate decorative details, some modern-day spirit houses have been pared down to basic triangular forms. Changes have not been limited to architecture either. 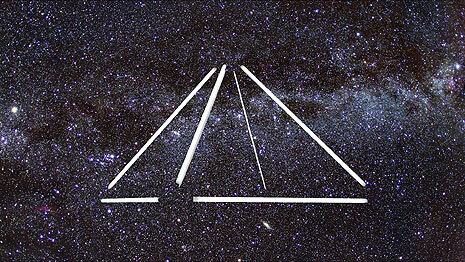 Symbolisms associated with sacredness have also undergone changes. In the past, light as a symbol of sacredness was usually represented by candlelight, clear glass or mirror reflecting natural light, but today these have been replaced by artificial light sources such as fluorescent lamps. Examples of this can be found at temple fairs, in the use of artificial candlelight and in the practice of marking Vassa by offering electric lamps to temples instead of wax candles. These phenomena show that, in Thai architecture as in Buddhist symbolisms, there has been a moving away from traditions of the past and towards architectures and symbolisms that represent “faith in a time of modernity”. Representing far more than superficial physical changes, “faith in a time of modernity” resulted from the creation of an impossible to find, and perhaps nonexistent, utopia of perfect goodness to serve as a spiritual anchor for the inhabitants of the modern world who are feeling emotionally insecure and in need of spiritual reassurance that this fast-changing world full of injustices will transform into a beautiful world. It is little wonder, then, that the modern world is seeing a growth of new and diverse schools of faith and religion, among them a “political utopia of perfect virtue”. ดังนั้น จากปรากฏการณ์ที่เกิดขึ้นทำให้เห็นว่า ทั้งงานสถาปัตยกรรมไทยและรูปสัญญะของสิ่งศักดิ์สิทธิ์ในพุทธศาสนาต่างก็มีวิธีในการออกแบบที่เปลี่ยนแปลงไปจากแบบประเพณีนิยมที่เคยมีมาแต่ในอดีต เกิดเป็นงานสถาปัตยกรรมและรูปสัญญะของสิ่งศักดิ์สิทธิ์ในพุทธศาสนาที่เป็นตัวแทนของ "ความศรัทธาในยุคสมัยใหม่"